21st Annual College of Engineering Distinguished Faculty Awards HonoreesThe College of Engineering annually honors faculty members for outstanding teaching and research. The 2018 awardees were recognized on April 26 at the 21st annual Distinguished Faculty Awards. Siddharth Rajan, ECE — For leadership in electronic materials research and education. Roberto Myers, MSE — For innovations in materials synthesis and design leading to breakthrough discoveries in spin-based electronics, spin/thermal effects and polarization engineered nanowire heterostructures. Established in 1983 with a gift from Doris and Stanley Harrison (’58, electrical engineering), this award honors an early to mid-career faculty member’s excellence in teaching and qualitative aspects of teaching, exceptional research, or contributions to engineering or architecture concepts. Gerald Frankel, MSE — For distinguished scholarship, national and international leadership, and inspired teaching and advising in the field of corrosion. Karen Murphy — For her unfailing enthusiasm and dedicated volunteerism and mentoring, which has guided and inspired countless chemical engineering students, particularly women and minority students. Mark Eppich and Jason Sanson, City of Columbus — For their outstanding long-term commitments to strengthen the environmental engineering capstone course and boost the professional experience for environmental engineering students. This award recognizes an individual or group from outside the Ohio State community for exemplary service to students of the College of Engineering or Knowlton School of Architecture. Kadri Parris, EED — For his exceptional teaching in the Department of Engineering Education and his tireless work in the First-Year Engineering program to ensure that all students receive an extraordinary first-year experience. Established in 2015, this award honors an individual lecturer, senior lecturer or other auxiliary faculty member who has demonstrated excellence in their teaching within the college. Avraham Benatar, MSE — In recognition of his innovative use of technology to enhance teaching and learning. Lee Potter, ECE — For creating innovative laboratory instruction and multimedia learning resources, and widely disseminating freely available licensed materials to benefit student learning. Named for the late Ralph L. Boyer (’24, mechanical engineering), the award is presented to a faculty team or to an individual faculty member who has made outstanding contributions to the improvement of undergraduate engineering education. Stuart Cooper, CBE — For providing outstanding mentoring and creating a supportive environment that has not only helped faculty to succeed, but also contributed to elevating the department’s national reputation. This award recognizes an individual faculty member in the college for demonstrated excellence in the mentoring of one or more early-career faculty members within the college. 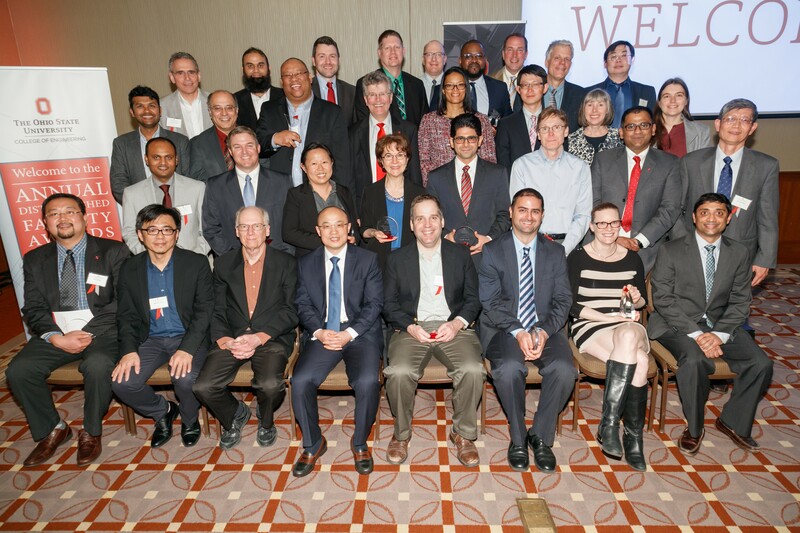 Subha Raman, Cardiovascular Medicine, College of Medicine — For catalytic leadership and vision in establishing a vigorous program of translational research impacting cardiovascular patient care. Glenn Daehn, MSE — For weaving professional development of K-12 science teachers with economic and workforce development, leading to the creation and adoption of materials science courses in high schools across Ohio and the nation. Arnab Nandi, CSE — For his contributions to and leadership of the OHI/O Hackathon and Informal Learning Program. Established in 2015, this award recognizes an individual faculty member who has demonstrated significant and longstanding achievement of positive community impact through outreach activities or programs within the college. La’Tonia Stiner-Jones, BME — For excellence in promoting diversity and creating an environment and organizational culture in which all individuals are accepted, respected and valued. Jessica Winter, CBE — For her development of fluorescent and magnetic nanoparticles for clinical diagnostic applications. This award recognizes the achievements of an individual or team whose innovation has successfully translated the research emanating from our laboratories into new products and/or technologies that can be used by the public at large. Bob Rhoads, EED — For his leadership in sustaining and expanding the capstone partnership to the benefit of students, faculty and the College of Engineering. The Honda-Ohio State Partnership Award recognizes an individual who has made significant contributions to promoting and strengthening this historic partnership. Paul Clingan, EED — For his dedication to helping students and using humor to create an engaging classroom environment that promotes student learning while encouraging students to always do their best. Named for the late Dean of the College of Engineering, this award is presented annually to faculty members who have demonstrated, in a superior manner, their interest in and willingness to help students and outstanding teaching ability. Anne Co, Chemistry and Biochemistry, College of Arts & Sciences; and Umit Ozkan, CBE, for their collaborative work in high temperature electrocatalysis, and the development of precious-metal free electrocatalysts. Jen-Ping Chen, MAE; and Han-Wei Shen, CSE, whose collaborative research is focused on feature extraction, uncertainty data modeling and input/output optimization. Junmin Wang, MAE; Xiaorui Wang, ECE; Haijun Su, MAE; and Richard Jagacinski, Psychology, College of Arts & Sciences, whose collaborative research has focused on cyber-human-physical systems, with an emphasis on enhancing the driving safety of individual vehicle driver-pairs. Named for John H. Lumley (’27, ceramic engineering), this team award recognizes interdisciplinary research accomplishments of the college’s faculty and research staff.